Let's see what the Creative Whack Pack holds in store for us today. Let's reach in and draw a card at random. 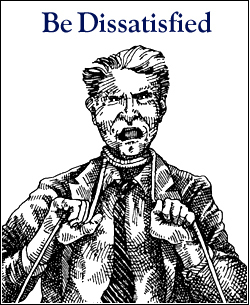 Why, it's card #44, "Be Dissatisfied," which is one of my favorites. An inventor was asked why he spent sixteen hours every day tinkering with his work. "Because I'm dissatisfied with everything as it currently exists in its present form." Dissatisfaction is beneficial to the creative process. Otherwise you lose the prod you need to spot potential problems and opportunities. What are you dissatisfied about? How can you turn irritation into inspiration? Maybe I'm "old school," but I think a lot of people don't make changes unless they're really dissatisfied with the way things are. I recently had several exchanges with Nedra Weinrich at Spare Change, (A Social Marketing Site) on the subject of "Do Symbolic Gestures Make A Difference?" She was addressing the issue of becoming aware of various social issues in order to make changes. But I personally feel (as does Nedra, I think) that awareness is only the beginning of a longer process. Here's a model I learned about long ago that I have found quite useful. If you want change, first you have to make people AWARE of the problem. Then you have to help them UNDERSTAND why the problem exists. Next comes the tricky phase: You have to lead them to a state of DISSATISFACTION in which they'll consider making some change. And finally comes CREATIVE ACTION. Moving from level to level can be a tough slog, but that's what's necessary if you want to solve some of the appearingly intractable problems. I'm not sure most people change (start companies, quit bad habits, buy something new) unless they are DISSATISFIED with what they're currently doing. And DISSATISFIED enough to make changes. This is an interesting topic. I think one of the key points here is that you can't (in my experience) explain to someone why they should be dissatisfied. I agree with you that the tricky part is leading them to a state of dissatisfaction. I don't think you can do that soley based on fact and explanation (not that I think you're advocating that!). It's mostly based on emotion. They need to feel it. The other tricky part is making sure those emotions don't backfire on you and you get a group of people terrified of change! Guiding those emotions into a positive creative force is really the magic. Roger, In my "MRI is Terrible Experience" post, I listed several areas of "dissatisfaction". But toward the end, I proposed some creative solutions about how it can be better. You make a good point stressing the willingness to make (or at least suggest) change. Thanks for your comments. I wish I could be more motivated by some big dream of "Ta-Da," but in my case at least 60% of the time it's that gnawing pebble in my shoe that finally makes me take off the shoe and in the process realize that I should've been wearing ice skates. I know I started my website because I was dissatisfied with work as I knew it, mostly still am, but the website gives me something so that my mind isn't always rolling around what I hate about work. I also found a passion in doing what I do, and that doesn't leave a lot of room for dissatisfaction. However, the website will never be done, so I'm always dissatisfied with it enough to tweak, fix and put up more content! An interesting hypothesis - dissatisfaction! I love your site and your blog. Excellent blog here! There is a good amount of useful information to be seen here! Thanks for sharing. Great info, ive been visiting your articles daily and really impressed with the topics on your site. Thanks.